Kyla Miller was born loving horses and was raised on a farm in a small community where being with horses and nature were natural for her. She excelled in school & sports and her natural curiosity drove her to explore new ways with all things. Driven and motivated, Kyla values hard work and academics. 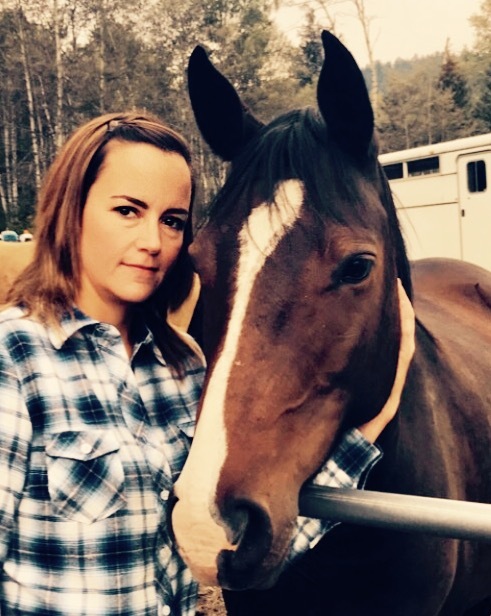 Her combined love of learning, farming & ranching and wellness and thinking outside of the box is why Kyla pursued her dream of working with people and horses- becoming a (FEEL) Facilitated Equine Experiential Learning in 2018. At the age of eight, Kyla was gifted with a very stubborn buckskin gelding named Bucky. They two learned a lot together as Bucky gave Kyla much more than a mount; he rooted a passion and a dream for her future. Bucky offered Kyla the most precious gift- a relationship full of connection, love, and understanding. The desire to have horses in her life grew, and Kyla was blessed to have many different horses of varying abilities. She competed in events, rode on cattle drives, trail rides and much more. Vivid images of her experiences are truly genuine. However a particular memory always arises; galloping (at high speed) across an open meadow on route back to the corral after a long day of moving cattle on her beloved mare- Brandy. Being in sync with her, ears forward, wind, nature, untouched land, brought a sense of true contentment and a place Kyla often returns too during times she needs balance and reassurance. Throughout all of this, Kyla became a Social Worker after moving to Alberta and marrying her best friend-Brian where she also started her family. Kyla’s has a unique and natural way of helping people. Always thinking outside of the box, Kyla aims to improve the quality of life of others in both her professional and personal life. Between balancing a farm, a family, work, and volunteering, Kyla continues to study human services further. Additionally, Kyla is trained and has obtained many certifications in the social service field including training in counselling. As well, Kyla is a certified First Responder (EMA) for the Forest Grove Volunteer Fire Dept., giving her skills in medical emergencies where she can help people and her community in other ways as well. Kyla also has over 6 years of experience working in the veterinary field as a large animal assistant and office administrator emerging skills in animal health and care.